Whether you are new to bowling or want to boost your game, head over to Whitestone Lanes in Queens, NY. This classic bowling center is open 24/7 and offers lessons from seasoned instructors to make improving your game fun and informative. Learn why this bowling center that has provided endless hours of game time for over 50 years is the perfect destination for lessons. Take lessons from a United States Bowling Congress® Silver certified instructor and enjoy high-quality, trustworthy coaching. Improve your game with high-tech assistance. One of the most difficult things for a bowler to do is visualize the ball path from the foul line to the breakpoint. From entry level bowlers to the most advanced, the Kegel Torch-X allows bowlers to see the initial path of the bowling ball like no other product before. This Torch-X is a simple light targeting tool used to help with accuracy and alignment. Using LED lights, it reflects a path of light on the lane to help you select the correct launch angle and hit your target time after time. As you move left and right, the light will change its position showing you exactly where you should throw the ball. The Torch-X was designed to explain the aiming process in a way that can be easily understood by everyone. From children, to beginning bowlers, to special needs bowlers, the Torch-X is an easy and fun way to quickly improve this important fundamental skill. Give yourself the gift of a custom-drilled bowling ball from this center’s pro shop. They also offer ball repair and finishing services in addition to accessories such as gloves, polishes, cleaners, braces, towels, socks, brushes, and finger grips. The center also features a bar, VIP lounge and party area, snack bar, and convenient parking. And since they offer 48 pristine lanes, you won’t lose time waiting for the next available option. 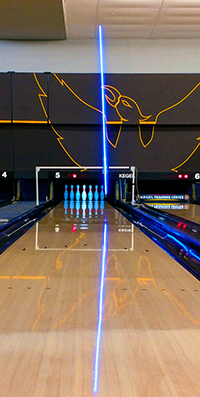 If lessons at this incredible bowling center are exactly what you need to improve your game, call Whitestone Lanes at (718) 353-6300 to speak with a team member. Learn more about the establishment online, including party options and specials. Follow them on Facebook for updates and news.